It's a move that does more than just show what happens to customers when there's a clash of tech-industry egos. It illustrates the options customers have between picking the closed Flash - or Silverlight from Microsoft - and open technologies such as HTML to serve content to a new generation of mobile computing devices. Virgin picked HTML to give users of iPhones and other mobiles the option in the future of checking in through their phone. The battle between Adobe and Apple has seen Flash deliberately excluded from the Jesus Phone. Chief information officer (CTO) Ravi Simhambhatla told The Reg: "I don't want to cater to one hardware or one software platform one way to another, and Flash eliminates iPhone users. This year is going to be the year of the mobile [for Virgin]." Simhambhatla hopes to let passengers check in with their phone at places like San Francisco International Airport during the second-half of the year. Virgin will issue an electronic boarding pass that you'll show security workers on your phone's screen. The only thing holding this up is approval by the Transportation Security Administration that runs security at airports in the US. 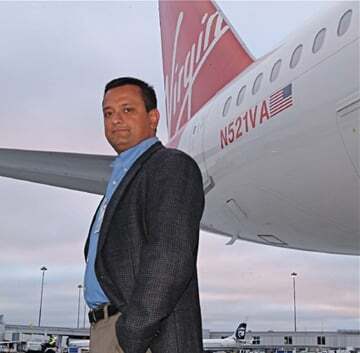 Virgin - based down the road from Apple and Adobe in Burlingame, California - picked HTML for a site that brings in more than 70 per cent of the airline's $100m in quarterly revenue. It's turned to HTML for a site it calls its "crown jewels" to give potential passengers a smooth online experience, with sliding animations and fancy Web-2.0-drop-down menus. The existing site was less than three years old.